A mob of about 20,000 angry Muslims burned down a Hindu village in Bangladesh after a rumor spread that a local had insulted Prophet Mohammed on Facebook. One person was killed and at least five more seriously injured after the Muslims attacked Hindu homes in the village of Thakurbari, in the Rangpur Sadar region of the country, on Friday. A villager had allegedly posted a defamatory status about Prophet Mohammed. 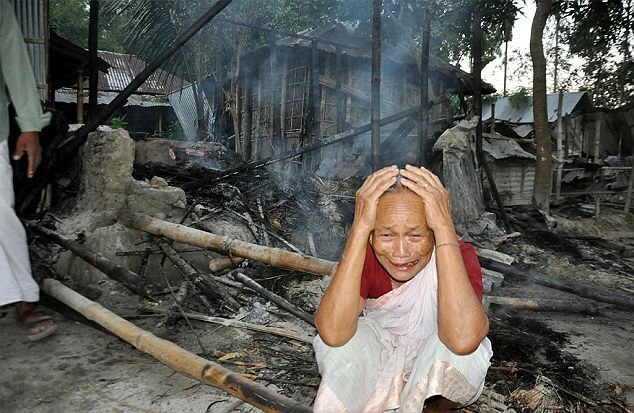 By the time police arrived at the village, at least 30 homes had already been burned down while others had been looted and vandalised, according to the Dhaka Tribune. Police fired rubber bullets and tear gas at the crowd after trouble flared. The mob later protested against the police response to the attack, blocking the Rangpur-Dinajpur highway for around four hours. Local magistrates are investigating the incident and families affected by the riot were being assisted by authorities, it was reported.